Off to New Zealand SALE!!! As many of you know, I'm off to New Zealand very soon... in 9 days as a matter of fact!! Now, I will be gone for 6 months, and it's not confirmed whether or not I will continue to run my shops whilst I am abroad. So... assuming I may possibly not run my shops for 6 whole months, you might want to get in there and buy whatever you've had your eye on at my online shop (or my other shop) fast! I'm closing up in 5 days. I'm offering a coupon code for 20% off all in store (including sale items) and this will run until I close my shop in 5 days time (Tuesday 12th June 2012). 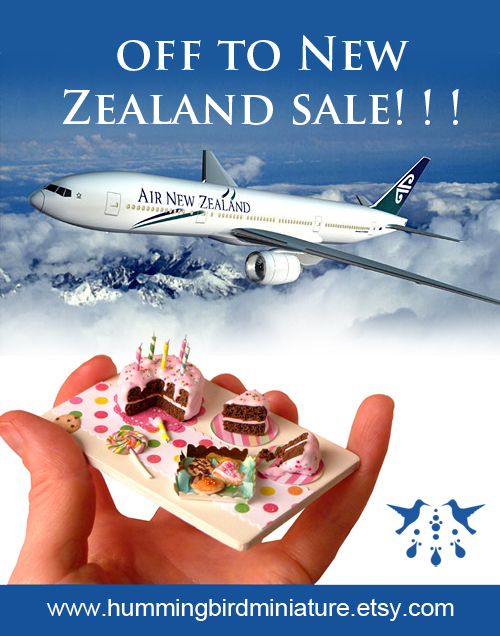 Enter the coupon code 'NewZealand' after you click to buy but before you pay and 20% will be deducted from the total amount, apart from postage. Enjoy! And feel free to contact me with any questions or concerns about my temporary move to New Zealand.